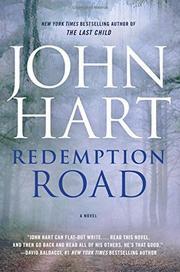 After an absence of five years, Hart finds more to mine in the fertile land of the Southern gothic. Hart returns brimming with plotlines and melodramatics. For starters, there are three emotionally and physically wounded characters. Front and center stands Elizabeth Black, a detective on the police force in an unnamed North Carolina city. Feisty, irrepressible Elizabeth has been furloughed after an incident in a cellar in which she pumped 18 bullets into two men who had bound and raped an 18-year-old girl named Channing. "Hero Cop or Angel of Death?" ask headlines, as a formal investigation into possibly excessive force looms likely. Elizabeth is also obsessed with Adrian Wall, an ex-cop in prison for the murder of Julia Strange. Black insists he’s innocent; she also suspects she loves him. And so she ignores department orders to stay away from Wall, seeking him out soon after he’s released from prison. Meanwhile, in a vivid scene that opens the book, Julia Strange’s son, Gideon, a 14-year-old whose “thoughts [run] crooked sometimes,” lights out from home and his father, “an empty man,” to shoot Wall the morning he walks free. Elizabeth, Channing, and Gideon are linked by troubled relationships with their parents, and the offsprings’ efforts to surmount the discord becomes a major theme in the book. There are, as well, other pertinent tropes—Wall’s case eventually raises issues of police corruption and prison abuse. Threaded through the steadily paced plot is a series of cross-cuts to the first-person narration of an unidentified man, a lurking bogeyman who moves, unobserved, among the other characters as he kidnaps and tortures several women. His identity is not hard to guess, and the familiarity of his scenes, however chilling, mars the plotting. A protracted action scene resolves the strands of the plot, and a touching epilogue lends a closing note of poignancy. Enough characters, confrontations, secrets, and subplots to fill the stage of an opera house—and leave spectators from the orchestra to the balcony moved and misty-eyed.